One thing Tripawd lovers can use to help their three legged dogs develop core muscle strength and balance is a Buja style balance board. We recently made a Buja board for Wyatt and wanted to share tips for how to make one. Download free homemade Buja balance board plans here! We originally discovered the benefits of a Buja board for three legged dogs from Dr. Laura Hady, a board certified canine physical therapist. This simple balance device also known as a rocker board or wobble board can help dogs strengthen their core body muscles with the following exercises. Lead your dog with a treat to have him walk across the unstable board and then back. Have him step completely on and off the board. Do not let him jump over it. Have your dog stand on the board and use a favorite treat to make him reach to his rear on the right side. Repeat on the left side. With your dog standing on the board, step on it to make the surface wobble. Do not let him sit down on the board. Have your dog stand still on the board and make her sit. From the sitting position, put her in a down. Have her sit back up, then stand and repeat. See Wyatt’s demo and other Buja board videos for more exercise tips! Just a few of each of the above exercises should suffice at first. Do not overdo it! Watch carefully for signs of fatigue and stop all exercises as soon as your dog tires. Please consult your vet or rehab therapist with any concerns. Download the attached DIY Buja Board Plans for detailed step-by-step instructions, and consider the following tips for making a homemade balance board for dogs. Select an appropriate size board for your dog. She should be able to sit and stand on it with all her legs. We made a 36 in. board for Wyatt, a 75 lb. German Shepherd. Consider sourcing your materials from a resale building material shop. We built ours for less than $10! You will need a piece of 3/4 in. 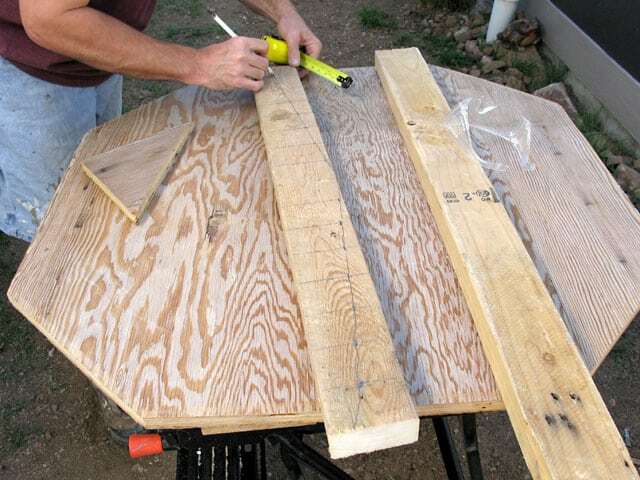 plywood for the surface and 2×4 lumber for the balance beams. Cut a square of plywood and remove the corners to make an octagon shaped surface. 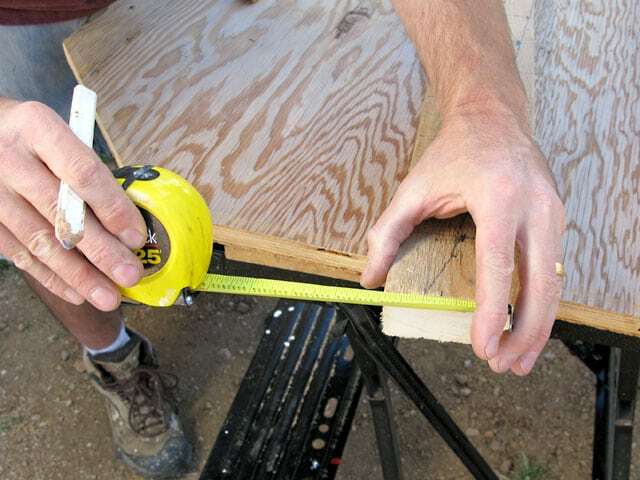 Make a handle by cutting a carrying slot at least 2 inches from one edge to ensure integrity of the plywood. 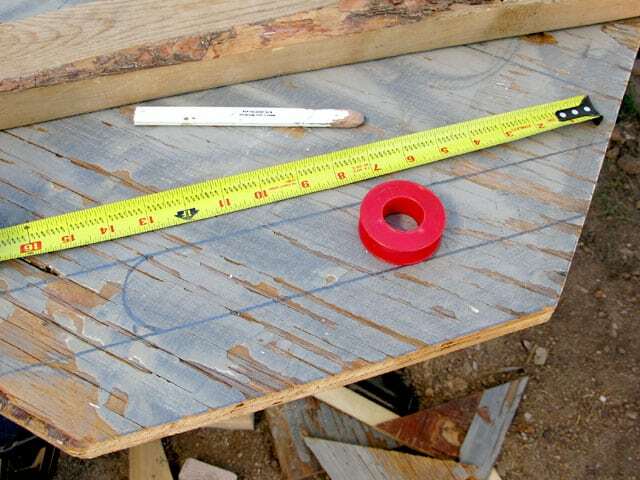 Cut one balance beam the same width of the board and use it as a template to make an identical second one. 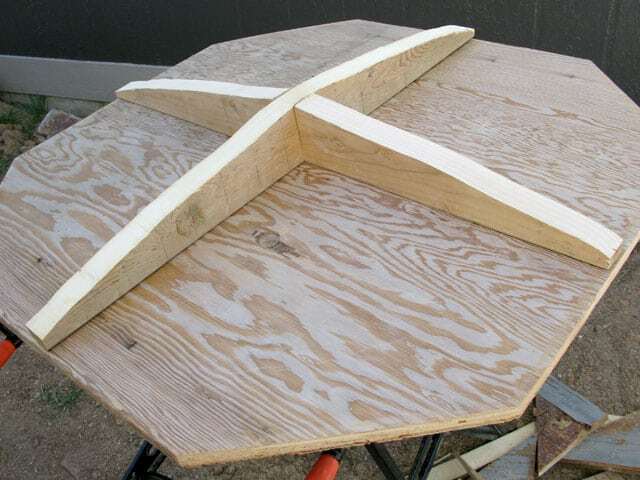 Cut 1 1/2 inches from the center of one beam to create two symmetrical pieces of equal length. Use incremental marks or a folded paper template to create symmetrical arc for beams. The steeper you cut angles for the balance beams the more difficult the exercises will be! Mark the center cross section on top of the board to indicate where beams will be mounted beneath. Mount the full length balance beam first, then mount the two smaller pieces on center at right angles. Secure 2 in. wood screws or nails through the board surface to attach the beams. Be sure to have fun exercising with your dog and share your tips and photos in your blog or the discussion forums! Not that handy with a saw? 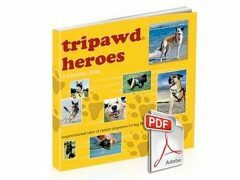 No problem, check out the Tripawds Gear blog post for a ready-made CanDo Wobble Board for Dogs! Please note that we are neither veterinarians nor incredibly skilled craftsmen. 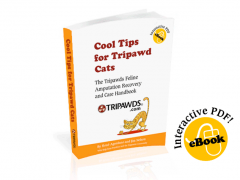 The attached Wobble Board Plans are intended as a guide only and Tripawds is not responsible for any harm resulting from the production or use of this project.